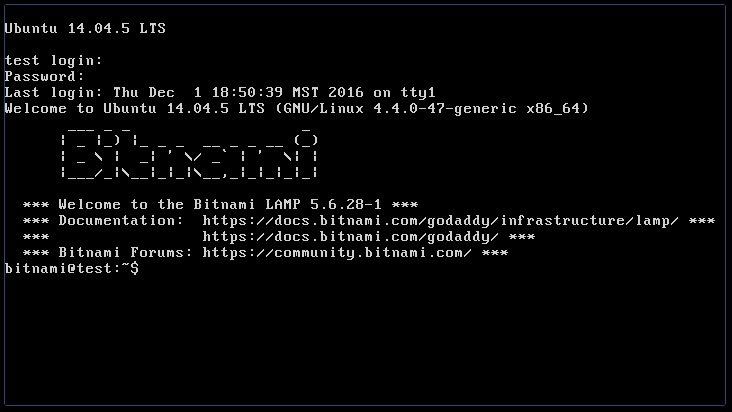 GoDaddy and the Cloud – SeanHiatt.ws :: Version 4.0! UPDATE: GoDaddy is discontinuing Could Server service on 12/31/2017. Please retrieve or back up your content before December 31, 2017. 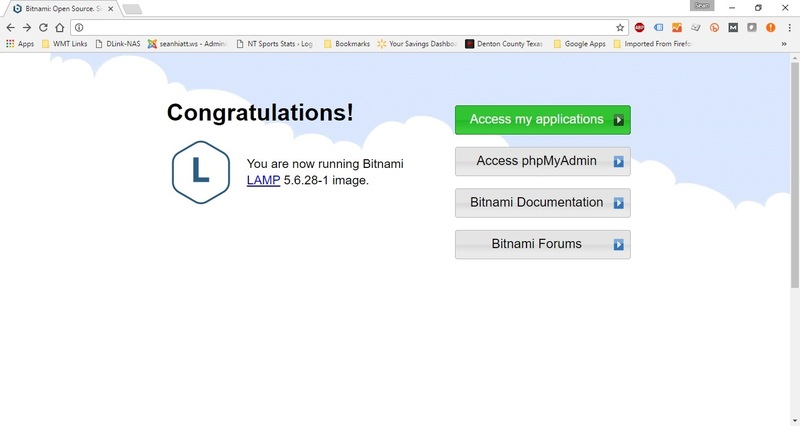 Bitnami apps and images won’t be supported after 11/15/2017. All other images and servers won’t be supported after 12/31/2017. Prior to these dates, you’ll still be able to build new servers, test, clone and destroy servers. Your billing cycle and billing rate won’t change. To replace your current plan, please consider switching to a Virtual Private Server, which provides fast, scalable and secure hosting. Today I created my first web server instance with GoDaddy on their cloud service. Earlier in the year they started to offer several cloud services. 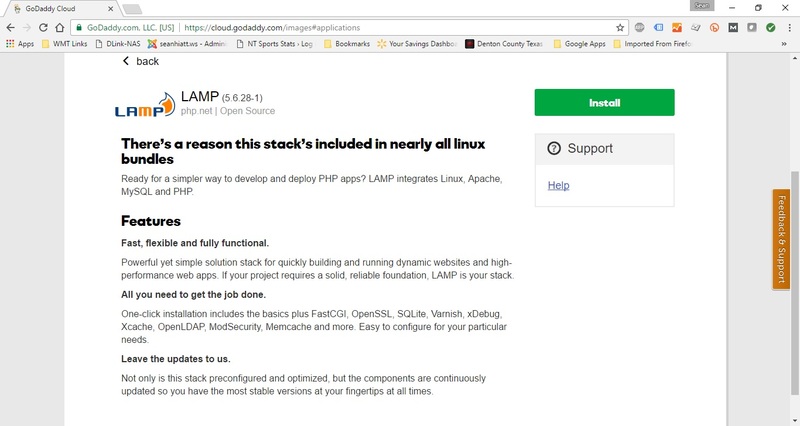 I chose the LAMP module, which unfortunately uses the Ubuntu Linux operating system, which I am not familiar with at all. I need to see about making sure all modules (PHP, MySQL, etc) are up to date. Perhaps next time I will just stick with CentOS as that is what I am most familiar with. I still could end up destroying this instance and recreating a new one with CentOS and just installing Apache, PHP, and MySQL on my own. Set up was simple and took less than five minutes to enter in all the relevant data and have the virtual servers spun up and active. with 10 minutes I had a test sub-domain set up to start accepting http requests. So far I have a very basic PHP set up that has a list of commonly used URLs that I frequently use. Later I will upload all the development files I’m working on to the server and continue developing what I have been coding for my stats site. My goal is to get that done this weekend. My main reason for doing this is I want move away from paying a one-time fee that spans several years for services I don’t use for all my sites. The hope is that it will actually cost less than what I am paying now plus I’ll have better site performance due to how GoDaddy runs their shared web hosting. I also want to set up my stats site to use HTTPS so that I make sure everything is more secure and improve my SEO results with search engines like Google since they place a higher value on secure sites. I also want to see about setting up a single service to work as a hot back-up for my MySQL Databases since MySQL has the option to perform data replication. The thought it to have all instances back up to another instance that might serve as a so-called hot swap system should an instance run into some sort of trouble. I’ve got a lot to work on though for this, as I need to learn how to navigate Ubuntu so that I can work around the command line a lot better. I also want to see about developing some pages to view stats like how much I have been charged throughout the billing period. GoDaddy has a bunch of API endpoints they have developed to perform a number of different tasks. I need to see about learning and understanding JSON and AJAX.